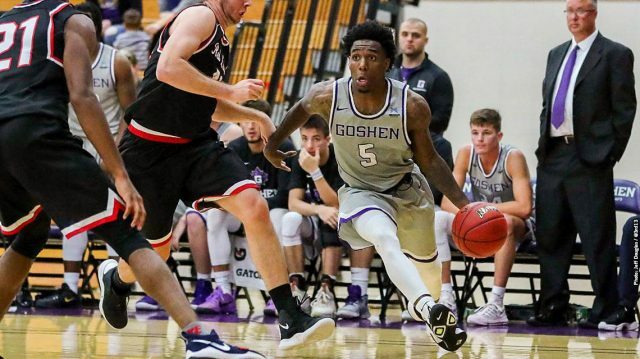 Last Saturday, Jan. 12, the Goshen College Maple Leafs traveled to Fort Wayne, Indiana to take on the University of Saint Francis. The Cougars were ranked at 19 in the country entering this one. The Maple Leafs really could have used a conference win to keep their postseason hopes alive. However, the Maple Leafs really came out sluggish in this one, not getting the start they had hoped for. The Maple Leafs trailed at the end of one half with a score of 48-38. The Cougars had many contributors to their 48 points in the first half. For the Maple Leafs, the team was led offensively in the first half by senior Demarkus Stuckey, who put 11 points on the scoreboard. In the second half, the Maple Leafs got a big boost off of the bench by junior center Tanner Camp who brought much needed energy to the floor. He sparked a 28-10 run in the second half to cut the 10-point halftime margin to just one at 72-71 late in the second half. The Maple Leafs kept it close for as long as they could, but in the end they fell short. The Cougars were deadly at the free throw line down the stretch in this one, preventing any comeback by the Maple Leafs. They shot a combined 22 for 25 good enough for 88% from the charity stripe. The Cougars would defend their homecourt in an 87-81 victory. The Cougars were led in the scoring column by junior Connor Lautzenheiser with 23 points. All five Cougar starters put up double figure scoring. The Cougars lacked the three ball in this game, shooting just 5-16 for 31%. Stuckey would lead all scorers pouring in 36 points on 13 of 20 shooting, nine of which were three pointers. The Maple Leafs hit a season high 15 threes on 63%. Where they lacked in this one was at the free throw line, shooting just 60% on 6 of 10 shooting. Redshirt sophomore Austin Branagan added 11 off of the bench for the Maple Leafs, the team’s only other player to put up double figures. With the loss, the Maple Leafs fall to 6-14 on the season and 0-8 in the Crossroads League. The Maple Leafs get set to resume action this Tuesday night when they travel to #5 Mount Vernon Nazarene.